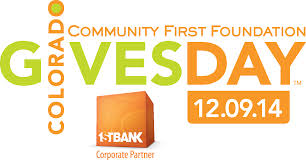 Tuesday, December 9 was Colorado Gives Day, and the Imagine! Foundation raised $23,745 from 130 donors during that day of giving! This year’s total was a 36% increase over last year’s total. Across the state, the campaign raised more than $26 million this year for 1,677 nonprofits through a record 107,862 donations. I had been aware of Imagine! for years but didn't fully realize the scope of its services until this year. My grandson is receiving assistance from both an OT and a Speech Therapist through Imagine!. You cannot even imagine what a positive difference these people have made in the lives of my grandson, his parents, and other family members. Thank you so much for all that you do. To all who donated to Imagine! or supported the many other participating organizations that make our community stronger and healthier, please accept my sincere thanks. P.S. If you weren’t able to donate on Colorado Gives Day, as you consider your year-end philanthropic decisions, impact the lives of people with intellectual and developmental disabilities by making a tax-deductible donation to Imagine! today.